We need a 1/2 inch chunk of hair to clearly see your color. (See photo.) Please do NOT send anything thinner. We will not be able to help you. 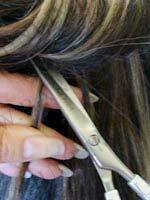 Do NOT send a snip of a "close match" hair piece you already have. We need YOUR hair. Many people are resistant to cut this thick of a piece in one chunk. There is another way. 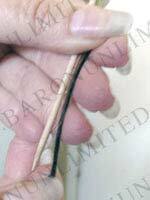 You can take FOUR 1/16" sections of hair (about the size of a toothpick) on different parts of your head which will then add up to the 1/2 inch thickness we need. 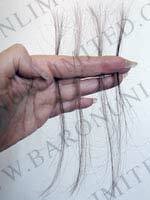 You easily lose that much hair in a couple of days just with normal shedding. 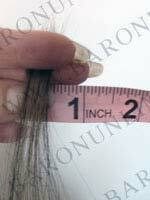 Section off about a 1/16" strip of hair (about the size of a toothpick). Snip off at the root so we can see the full color root to end. 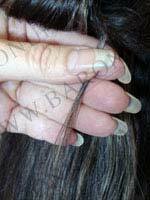 If your hair has multiple colors, make sure your sample has all the colors. 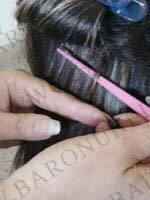 Do this three more times on different parts of your head so that you will have 4 thin hairsamples. Then put the four thin snips together at the root with tape and that will be about 1/2" which is enough hair for us to see the color. Tape the sample together at the top. Then tape or staple the sample securely onto a piece of paper. We get hundreds of samples, so be sure to put your name and email address on the piece of paper that has your hair sample on it. Please list the specific items you are interested in. For example: clip-on bangs, Sigrid hair piece, Alex man's wig. Please do not put a generic item such as: "hair piece" since not all items come in all colors, and colors may vary with each product. 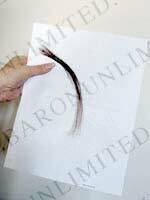 You can also mail your order including the hair sample using this mail order form.